(Phys.org)—Researchers have created a self-powered electronic watch that harvests energy from the wearer's wrist movements for continuous operation. By combining two different energy conversion mechanisms (electromagnetic and triboelectric) in a single hybrid nanogenerator, the device can harvest significantly more energy than previous harvesters that use only a single mechanism. The scientists, led by Ya Yang at the Beijing Institute of Nanoenergy and Nanosystems in China, and Zhong Lin Wang at the Georgia Institute of Technology in the US, have published a paper on the hybrid nanogenerator in a recent issue of ACS Nano. "This kind of nanogenerator can also be utilized to power other wearable electronic devices, such as a wireless smart pedometer for reading data on walking steps, distance, and energy consumption," Yang told Phys.org. The hybrid nanogenerator consists of a small box (3.6 cm x 3.6 cm x 3 cm) with a magnetic ball inside. When the wearer moves their wrist, the ball's motion generates electricity by both the electromagnetic and triboelectric effects. Due to the electromagnetic effect, when the ball collides with six metal coils on the sides of the box, the ball's mechanical energy is converted into electricity. The triboelectric effect occurs when two materials are rubbed together, similar to how rubbing a balloon on a person's hair creates static electricity. Here, the watch strap serves as the triboelectric component. The strap is made of two materials with different triboelectric polarities, nylon and a polymer composite, which are attached to the bottom of the box and to two electrodes. When the moving magnetic ball presses down on the watch strap, the nylon and polymer come in contact with each other, generating triboelectric charges and causing electrons to flow between the electrodes. The researchers experimented with the way that different wrist movements can charge and power the watch. They found that the best wrist movement is a twisting motion that can generate a current of up to 12 mA, which means that thirty-nine seconds of this twisting motion can power the watch continuously for about 7.5 minutes. 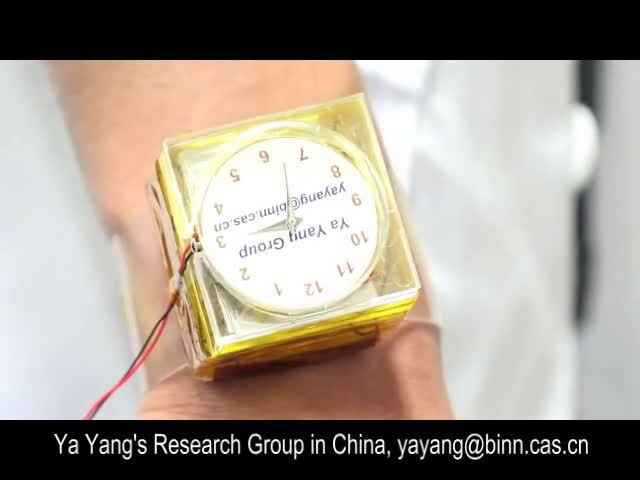 By adding a homemade Li-ion battery to store the energy produced by the hybridized nanogenerator, the researchers found that 32 minutes of the twisting motion can generate enough energy to continuously power the watch for more than 3.5 hours. Based on this data, the researchers calculated that 3.6 hours of wrist movement can generate enough energy to power the watch for one day of continuous operation. Since the current prototype is rather large in size, the researchers attempted to reduce the dimensions by replacing the magnetic ball with a thin magnetic sheet. 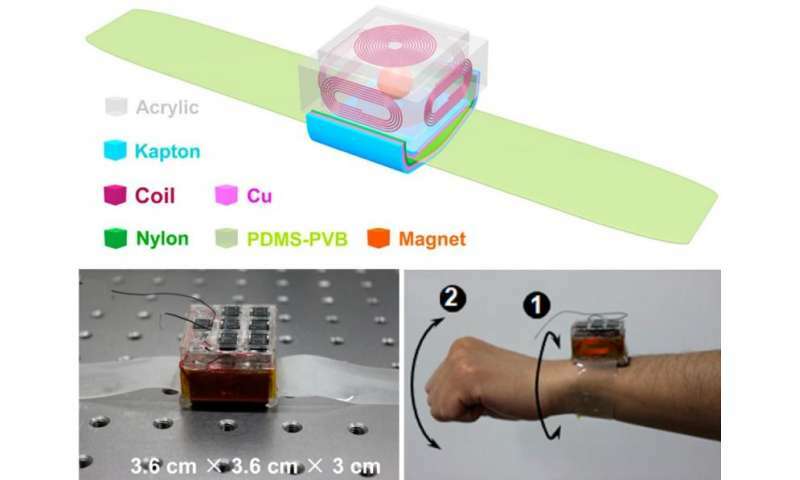 However, they found that the magnetic sheet does not move as easily as the ball, and so in the future they plan to investigate other methods of miniaturizing the nanogenerator. They also hope to eliminate the need for the battery. "The future plan is to solve the power source issue of the wearable electronic device, so that these devices can work sustainably without being charged by the external power source," Yang said. "Ideally, the motion of human-body-induced energy will be enough to power these devices." What a fantastic grammar school science project. When these "researchers" graduate high school I expect great things from them. Stick it to a Fan when not on Wrist? These guys need to build a better clock. Standard 32.768kHz watch crystals only need about 1uA or less to operate. With that and LCD screen, probably less than 5uA. In that case, 1 second of wrist twisting would give 40 minutes of watch time. Which is 200 times better than the result of this research. I can only think that these researchers are really lazy. I could build something far better in an hour. If only I had realized I could get a paper out of it! EDIT: I would also point out that their use of the triboelectric effect is fairly pointless. It greatly adds to the complexity and cost, and they wouldn't need it if they had designed the clock properly in the first place. In that case, 1 second of wrist twisting would give 40 minutes of watch time. Which is 200 times better than the result of this research.... they wouldn't need it if they had designed the clock properly in the first place. could you do this with a mechanical/analogue watch face and not a digital one? that is why i asked AXE to fill in some info. maybe we can crowdsource an experiment of our own? buy some older Seiko's and such? - you could probably just use a supercapacitor instead of a battery, they are very cheap these days and have excellent charge/discharge efficiency. Just make something like an electret microphone - a sheet of charge-embedded plastic suspended over a metal sheet. Whenever the charged sheet vibrates, the capacitance changes and generates an AC waveform on the metal sheet. Connect that through a charge pump to the supercap, and you're all set. I had Seiko kinetic. Electronic watch with analog movement. Charging from hand motion was working flawlessly. But the rechargeable batteries lasted about 5 years, and needed replacement. So I gave up on the watch after the second replacement battery died. In any case, the author's 'discovery' is about 60 years old. Also, my wife now wears two Citizen watches with solar charging (not at once, gold or blue face - depending on the rest of the attire). They need a few hours a week of being under artificial lighting, of 15 minutes or so in sunlight. So, no special care for charging was taken, except just leaving them face up when not wearing. Much simpler design wise, and works 3 years without any hint of being not charged enough. Summary: it is nice for your Master of Engineering diploma project, guys, but having this 'accomplishment' displayed prominently at Phys.org is not serious. Last words - the SIZE of the thing! a) the watch needs a solar panel surface. b) over top of this would be a transparent display screen. c) the screen would show the type of chronometer display as seen with the Geneva Emerald Sequoia iPhone app. d) a push button on the side could be used to "flip" the display screens. e) a second button could be used to set the clock in the first place (unless one preferred to do this via bluetooth using their computer/smartphone). This is all very easy to do these days. BTW can I get a patent on this? Possibly, but it's expensive and time consuming. If you're in the USA and haven't done this before, it'll cost you between $6000-15000 and several weeks of your time. The cost is for the patent attorney (which really is necessary), and about $300-1000 for the actual filing. If you already know what you're doing you can probably get it down to $2000-4000. Since it's expensive, you'll obviously want to check that it isn't already patented. You can search patents on the USPTO (United States Patents and Trademarks Office) database. I would be surprised if it wasn't under development someplace. My combination of ideas is so 2009! i knew that the LCD would be more efficient, i just wondered if the whole point was the use of an analogue face was their attempt to do something new...???? There are analog watches that run for years on a single watch battery. Nothing in this article is new or ground breaking, Everything about this article epitomizes the publish or die mentality of today's academia. As was pointed out before, look at the size of this monstrosity, my god something that size could provide all the computational power needed to manage the space shuttle. @MR166 You are right about the "Publish papers or die" model in today's academia. I read a few years ago that the results of an experiment are in average published in 6 different papers. It is obnoxious and counterproductive. In my opinion it should be the opposite, one paper should be based on several different experiments, scientists shouldn't be pressured to constantly write papers in order to justify their existence.